Double Column Series are longitudinal by hydraulic, cross feed axis and vertical axis by AC servo motors. 1. Rigid Slant Beam : The PERFECT double column surface grinder is designed with slant beam construction. This provides outstanding load distribution on the entire beam surface, assuring maximum stability during heavy’ duly grinding. 2. 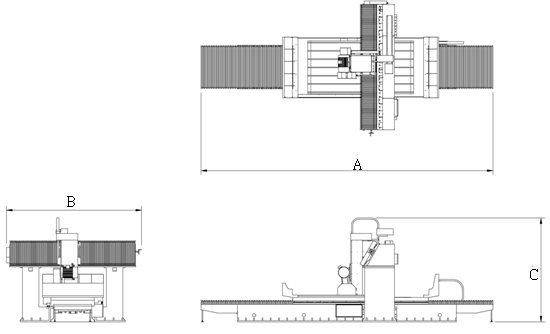 Heavy Duty Linear Guide Ways : The beam surface Is equipped with two heavy duty linear guide ways with great span for extra smooth movement and high rigidity. 3. Precision Feed on Vertical-axis : The veritical axis is equipped with high precision linear guide ways combined with high precision ball screw transmission, assuring outstanding feed accuracy and maximum stability. 4. Variable Table Speed : The variable feed speed of the table Is controlled by a proportional hydraulic valve, allowing for feed speed adjustment according to the workpiece type for increased convenience of operation. 5. All major parts are manufactured from high tensile cast iron, tempered and stress relieved for best rigidity and stability. 6. Structural parts are rib reinforced for outstanding rigidity. 7. Slant beam construction for outstanding load distribution. 8. Short distance from the wheel spindle to beam surface ensures high stability for heavy duty grinding. 9. Linear guide ways on Y, Z-axis. 10. High precision, pre-tensioned ball screws reduce thermal strain while ensuring high positioning accuracy. 12. Vertical and cross feed are controlled by AC servo motors and M.P.G. handwheel. 13. Extra wide span between columns for outstanding rigidity. 14. Vertical Wheel Head (optional) : Upon request, the machine is available to equip with a vertical wheel head. It is suitable for grinding box slideways and dovetailed slideways. 15. AD5 auto down feed system is standard and making operation more convenient. ADD: No.6, Jingke 7th Road, Nantun District, Taichung 408, TAIWAN R.O.C. © 2014 PERFECT MACHINE CO., LTD.